Visiting Florida's Everglades with kids presents a few challenges... Flamingo, (the main hub of activity in Everglades National Park), is a long 38-miles from the park's entrance-- and most visitors will have already driven south from Miami first. Secondly, the drive has little variety or dramatic scenery. Luckily, the solution is simple: stop at each and every one of the wonderful trails and visitors' centers along the way. Stop the car, listen to the quiet, feel the breeze-- slow down. Hear the bird calls. The nature walks are short enough for kids to enjoy, and several have boardwalks that take you right into the "river of grass" -- i.e. 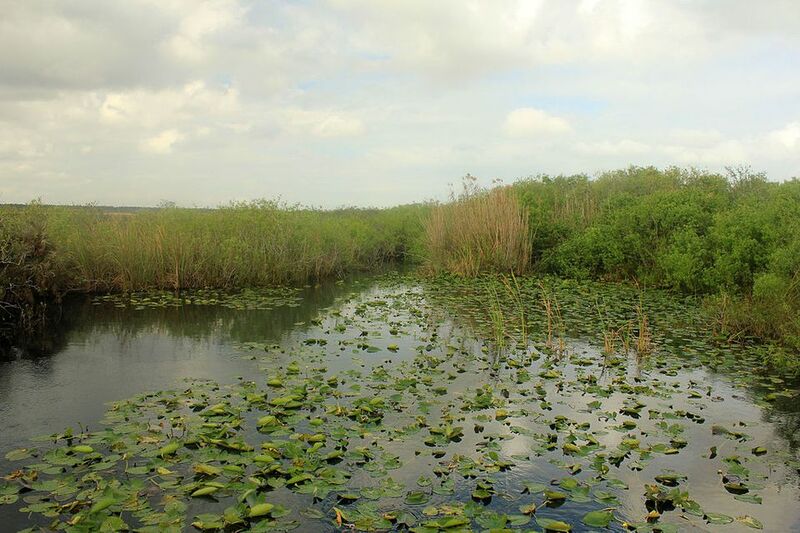 the sawgrass marsh-- where you're sure to see birds and other animals. The Amhinga Trail at the Royal Palm Visitor Center (four miles from the park entrance) is half a mile long through sawgrass marsh; you may see alligators, turtles, anhingas, herons, egrets, and many other birds. The Mahogany Hammock Trail is 22 miles further south, and has a boardwalk through dense jungle-like trees: gumbo-limbo, and the largest living mahogany tree in the US. You'll find a lodge, camping, restaurants, general store, marina, boat tours, mangrove swamp-- and maybe a couple of crocodiles lounging at the boat- launch. Note: Hurricane Wilma in 2005 damaged the building that housed the Flamingo Lodge and the Flamingo Visitor Center, and it has not been rebuilt. For lodging: many people camp at Flamingo: but watch out for snakes! Houseboat rental may be another possibility. We sampled a Boat Tour led by well-informed guides. Our two-hour trip was highly educational, but long for young children. We saw alligators, crocodiles, and many birds; manatees were probably near but couldn't be seen in the dark water (stained by tannic acid from the mangrove trees.) Bring lots of drinks and snacks! See the Everglades National Park site for info about canoe rentals, bike rentals, boat tours, hiking, Park Ranger programs, and other activities; camping information, too. We visited in November, and temperature was ideal but we did need mosquito repellent even at that time of year. From April to October, insects may make visits unbearable, especially for kids. The wet season begins in June; summers are hot and humid, with many afternoon thunderstorms-- and mosquitoes. Best time to visit is from November to March. Wildlife viewing is best in winter too. If you can't drive the 38 miles to Flamingo, you can still get a nice taste of the Everglades on the trails at the Royal Palm Visitor Center, just four miles into the Park. Or head west from Miami instead of south: the Shark Valley area has trails and a 15-mile Tram Tour. Finally, many people think a visit to the Everglades means skimming over the sawgrass on an airboat ride. Airboats aren't allowed in the Park, but many companies outside the Park boundaries do offer rides.